Rebecca Garrison, with the Highway 50 Transportation Management Association, discussed a BRECA area community bicycle ride planned for May 4, 2017. It will start at the Rancho Cordova Library at 6:30 pm and go for about three miles. There will be an ice cream buffet afterwards. Please RSVP for the ice cream. Information is on the BRECA web site. Officer Tommy Riggins, with the California Highway Patrol (CHP), discussed traffic enforcement in the community. He stated that the BRECA area is pretty quiet. There have been three car crashes on Mira Del Rio Dr. in the last year, all single vehicle. He stated that the CHP is targeting Folsom Blvd. for pedestrian and bicycle safety. Officer Riggins responded to several questions from the audience. One question concerned the right turn from West bound Folsom Blvd. to North bound Butterfield Way and whether a car should do the right turn over the bike lane. Officer Riggins responded that it is a broken white line, so the turn is OK. Another question was about the intersection of Bradshaw Road and Oates Drive, where there is heavy traffic around sundown on Friday and Saturday from the Drive In theater and there are a lot of people making illegal moves. Officer Riggins stated that they could check it out. Another question concerned the intersection of Bradshaw Road and Mira Del Rio Dr., where there is a blind corner, and whether speed bumps could be installed. Officer Riggins responded that the questioner should talk to the County about speed bumps. Another question concerned the stop sign at Allegheny and Elmira, which gets run a lot. Officer Riggins responded that he will put in a traffic complaint about it tomorrow. If they can get a license number, they will follow up on the problem. Another question concerned having a cable from a house to a car. Officer Riggins responded that as long as it does not impede the sidewalk it is OK. Officer Riggins gave out contact information: 861-1300 for a non-emergency report to the CHP, and his direct line 464-1457. Ann Marie Schubert, Sacramento County District Attorney (DA), discussed some issues of importance to the community. She stated that a couple of problem areas are mental health and homelessness. These are not illegal, but are often associated with issues that are illegal. She stated that they have programs to help people get back on track, such as drug courts. She stated that they have 175 lawyers in the DA’s office, 45 investigators, and a crime lab. In Sacramento County they get around 45,000 crime reports per year, and file around 25,000 cases. She commented on Proposition 47, passed by voters in 2012. Called the “Safe Schools and Neighborhoods Act,” it made all drug possession crimes a straight misdemeanor, and almost all thefts misdemeanors, even if there are multiple thefts. She urged people to report crimes: if crimes are not reported, law enforcement and others think they don’t exist. Shawna Franklin, of the DA’s Community Prosecution Division, stated that they work on chronic offenders. She stated that she is used to putting people in jail, but times have changed, and the voters are saying find other ways. The Community Prosecution Division works with Problem Oriented Policing (POP) officers on problem properties. Jeff Wall, the new POP officer, stated that they work a lot on dope houses. One problem is that possession is a misdemeanor, and often not prosecuted. Sometimes there are other ways to get at the problem: for example, power theft is a felony. DA Schubert commented that she was pleased that the Sacramento County Board of Supervisors voted to ban outdoor commercial grows of marijuana, although up to 9 plants for personal use is OK. Shawna Franklin commented that marijuana is a source of violent crimes: recently there was a murder trial over a $20 bag. POP Officer Wall stated that grow houses are an easy target for crime, as they have marijuana and money. DA Schubert stated that the Federal government still considers marijuana a Class I restricted drug, so banks do not want to handle the money, resulting in lots of cash. POP Officer Wall commented that a lot of the problems have to do with homelessness and mental health issues. They do cleanup of homeless camps, but have to give 48 hours notice to vacate, and so just end up pushing the problem around. There were a number of comments and questions from the audience. One comment from the audience was that there used to be a drug house across the street from their home. The POP officer and DA’s office worked together on the problem, and now the owner is living in the house, and the situation is much better. One question concerned a homeless camp behind the strip mall at Bradshaw Road and Folsom Blvd., and that they move and then come back. POP Officer Wall stated that the area behind the strip mall is fenced, and so it is hard for officers to get in there. Another comment was that the person had a rental property that had drug activity, and they worked with the DA’s office to get the people out. Now, he wants to sell to prospective homeowners. Another question was whether there is a problem with no room in prisons. DA Schubert responded that there was a problem: there used to be around 170,000 people in prisons, and now it is down to 120,000. A lot of people are back in the community. POP Officer Wall commented that one should not leave possessions in vehicles. One person in Rosemont left tools in the back of his truck, had them stolen, then left more tools in the back of his truck, and had them stolen again. Ranger George Olveda, with Sacramento County Parks, stated that his stewardship area is from Gristmill to Guy West Bridge. He stated that he does not get a lot of complaints from this area. So, mostly he works in the Discovery Park and I-80 area. He stated that there have been complaints about the loss of a large tree at the Gristmill entrance, and that the biological people of County Parks are working on revegetation. He stated that they will be enforcing the regulation of off-leash dogs, as a person was bitten, and that citations will be given out. He also stated that someone had weed whacked a trail in the area, and that this is illegal. There are protected species in the area. If someone has a problem they should call the County general number 311. Ranger Olveda responded to several comments and questions from the audience. One comment was that the “fire trail” near the river was down to one lane, and that the person wished to be able to see snakes. Ranger Olveda responded that he would talk with maintenance about the situation. Another comment was that rangers drive on the levee, but don’t walk the trails. Ranger Olveda repeated that they seldom get calls from the area, so driving the levee generally works out. Another comment was that the person had heard bicycle riders saying that Gristmill is a good place to ride on the dirt paths, since there are no rangers there. Ranger Olveda responded that he will talk to his partner, who likes to walk the trails. Another comment was that from the “breezeway” to the “farm” there is no break between the vegetation and people’s back yards, which is a fire hazard. Ranger Olveda stated that they have had crews creating space in the past, and that he would look into the situation. Patrick Larkin, District Administrator for the Cordova Recreation and Park District, stated that he is new on the job, and has been District Administrator for four months. He stated that he has about 27 years background in parks. He commented that voters in the District had just approved measure J, which provides new money for the District. They intend to work on older parks in the area, and are having workshops on what to do. Their goal is safe, clean parks. District Administrator Larkin responded to several questions from the audience. One question concerned a senior discount on Measure J. District Administrator Larkin confirmed that there is a senior discount on the Measure J assessment. Another question concerned fixing the pathway in Riviera East Park, which is broken up. District Administrator Larkin stated that the repairs would be costly, and that they are looking at them in the context of Americans with Disabilities Act compliance. Another question was what is being done about the pool at Hagan. District Administrator Larkin responded that they are looking at what to do, and do not want to just repeat the 1960-era plan. 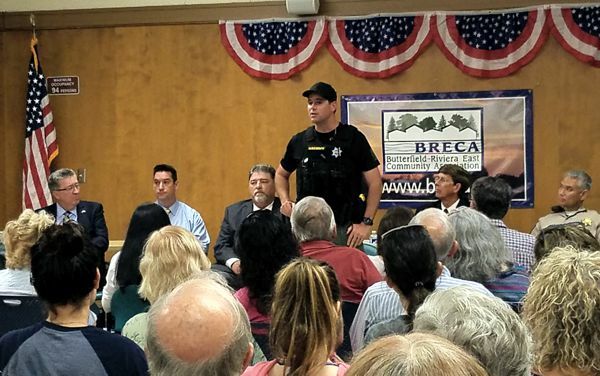 Supervisor Nottoli commented that the community is well represented by the BRECA leadership, and that he appreciates the community involvement. He stated that the high water this year on the American River had brought homeless issues to the fore. People who were camping on the Parkway have moved to outlying areas, including the BRECA area. He stated that they are having meetings with the cities and want to find things that work. He stated that there are a couple of approaches being considered. One approach is to meet homeless people where they are, and offer opportunities to make change. Another approach is to have a “full service center” where homeless can come and get connected to all of the available resources. A problem with the latter approach is where it is to be sited. Supervisor Nottoli responded to several comments and questions. One question concerned whether anything was happening with the Folsom Blvd. streetscape. Supervisor Nottoli stated that some places are getting funding, and that they hope for funding from the recently approved new state taxes and fees. However, priority is on fixing the pavement, as many streets are in bad shape. Another question concerned the redevelopment of the Drive-In theater. Supervisor Nottoli responded that the project depends on getting a critical mass of retailers, which has not happened yet. Another question concerned the status of the large property across Folsom Blvd. from the Butterfield Light Rail Station, which was just sold to an apartment group. Gay Jones commented she had just received an update from the County, and that the subdivision map expires on June 22, 2017, but zoning remains. BRECA’s three guidelines are blending with existing community, connectivity, and full parkland dedication on site, of 3.2 acres. Supervisor Nottoli stated that when the subdivision map expires, the new owners will come out with their own plan. Another question concerned a recent fine of $500 for a code violation. To appeal the fine would cost $700. Why is that? Supervisor Nottoli commented that if the appeal is successful, the appeal fee could be waived. Another question concerned the effort by Regional Transit (RT) to sell the parking lot at the Butterfield Light Rail Station. The questioner stated that it should remain a park-and-ride lot. 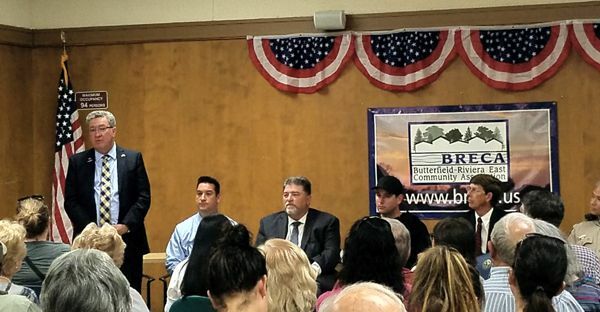 Supervisor Nottoli stated that RT is getting rid of surplus property, and that he would carry the concern forward. Another question was why RT does not charge for parking at the Butterfield Station. Supervisor Nottoli stated that if there was a charge for parking, people would just park in the adjacent neighborhood. Gay Jones commented that BRECA has supported maintaining the 149 spaces at the park-and-ride lot. Supervisor Nottoli stated that he could have the RT General Manager come out and talk to the community. Another question was whether Supervisor Nottoli could help with the proposed California American Water rate increases and area consolidation. 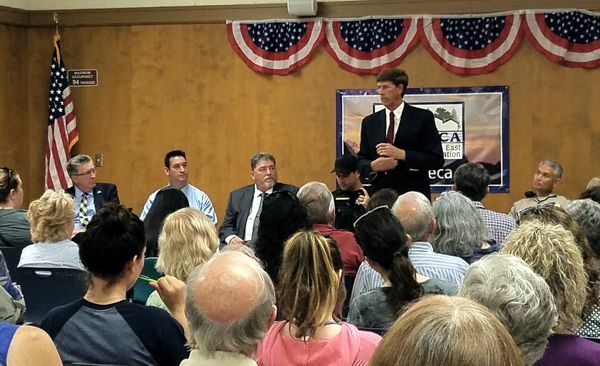 Supervisor Nottoli stated that the California Public Utilities Commission had changed the rules on area consolidations, and suggested talking to Assemblyman Cooley. Gay Jones commented that BRECA is a party to the proceedings A.16-07-002 with the proposed rate changes and area consolidations. Rebecca Garrison with the Highway 50 Corridor Transportation Management Association state that they work with alternative transportation along the Highway 50 corridor. She stated that May is bike month, and that they would like to do a community bike ride in the BRECA area. The date is to be May 4, starting at 6:30 pm. It is to be a family bike ride, about 4 or 5 miles, taking about 30 minutes. They will do the organizing, and BRECA is to get the invitation out to neighbors. It was agreed to participate. Bonnie Domeny made a motion to adopt the draft minutes for February 28, 2017. Gay Jones seconded the motion. The motion was approved unanimously. Lucy Phillipson asked if there was anything that could be done about “blight.” In particular, a tree fell down on a fence across the street from her house and nothing has been done about it. She noted that the residents of the house speak Chinese. Bonnie Domeny commented that if it is a code violation, one could call 311, and the County will come and investigate. Rene Hamlin commented that if 311 does not get a result, then call Supervisor Don Nottoli’s office. Gay Jones commented that it is good to get different people to call in. Amy Gillingwater stated that she broke her leg in a hole in Riviera East Park about three weeks ago. She noted that the hole was filled in the next day. Bonnie Domeny stated that additional work had been done around the park filling in depressions. Money from Measure J should become available in the second quarter of 2018. Andrea White handed out a financial report on income and expenses so far this year. She stated that she would try to schedule a Budget Committee meeting in the next few weeks. Gay Jones stated that the main issue at the recent Cordova Community Planning and Advisory Council (CORPAC) meeting was Two Sisters Recycling in Rosemont. They need to apply for a variance. New County rules require recycling to be inside, but pre-existing locations can apply for a variance. Three people from the neighborhood spoke in opposition, attributing scavengers in the area to the existence of the recycling business. Carmen Mitchell commented that there were no problems with bugs or cleanliness at Two Sisters. The variance was approved on a 6 to 1 vote. Gay Jones stated that the comment period on the Notice of Preparation of an Environmental Impact Report for the West Jackson Highway Master Plan had been extended. Carmen Mitchell stated that the new sign at the Capitol Christian Center is bright, and what was built is different from what was presented to CORPAC and BRECA. Gay Jones noted that several variances were approved by the Board of Supervisors on a 3 to 2 vote. Bonnie Domeny commented that once something is in place it is hard to change. Kelly Cohen made a motion that the Chair send e-mails to Supervisor Nottoli and the Capitol Christian Center, stating that the lights are bright, and please turn them down. Gay Jones seconded the motion. It was noted that when the Capitol Christian Center representatives gave a presentation to BRECA, we did not take a position on the sign. Rene Hamlin commented that we had been assured the sign would not be that bright. The motion was approved unanimously. Gay Jones commented that ranger reports are available on the Parks web site. She also spoke with Chief Ranger Mike Doane and he would like a letter supporting continuing to issue citations for illegal camping. Lynda Hammitt reported that the existing membership application form is now on the BRECA website. She also said that Lori Christensen had completed a list of accomplishments, and that a new membership flyer had been completed. Jim Morgan stated that he had some concerns with the flyer. In particular, it did not have a place where people could volunteer for specific tasks. Volunteers have been very helpful in the past, especially with mailings and door-to-door distribution of flyers and the Newsletter. Andrea White stated that the volunteer section did not seem like that important a use of space, and that the lists could become outdated. Lynda Hammitt stated that we could send a follow-up e-mail about whether people are interested in volunteering. Bonnie Domeny stated that the main goal was to get space for better graphics, and that she would like to test the new flyer at upcoming events and see how it works out. The general decision was to go with the new flyer. Lori Christensen commented that the Easter Egg Hunt banner is missing. People will look for it. Bonnie stated that there is to be an egg-stuffing party on April 7th, and the flyers are to be mailed tomorrow. Gay Jones stated that the BRECA motion for party status had been sent. 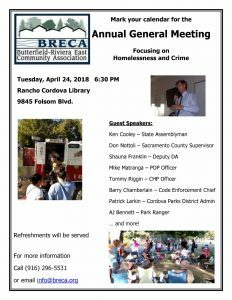 Suggestions for people to invite included Supervisor Don Nottoli, Assemblyman Ken Cooley, the Problem Oriented Policing (POP) officer, a representative from County Code Enforcement, and a representative from Cordova Parks. Lori Christensen commented that there is a need to get started on the flyer. Bonnie Domeny stated that she will work with Rene Hamlin on the flyer. Jim Morgan stated that the BRECA comments on the West Jackson Highway Master Plan Notice of Preparation of an Environmental Impact Report had been submitted. Jim Morgan outlined the process for the upcoming Steering Committee Election. Nominations will be accepted between the March and April BRECA meetings. Those who accept nominations become candidates, and will be requested to submit candidate’s statements. The ballots and candidate’s statements will go out about 7 to 10 days into April, with about two weeks for members to vote. Votes will be counted at the May meeting. Gay Jones stated that she would like funding for purchase of native plants for planting in the Parkway and bags for Starthistle pulling. She made a motion that $70 be authorized for sponsorship expenditures for Mile Marker 12 South, of the American River Parkway. Andrea White seconded the motion. The motion was approved unanimously. Kelly Cohen stated that she had been working on an area behind her house for several years. She would like to plant some native plants, like creeping wild rye. Jim Morgan inquired as to whether a permit from County Parks was needed. Gay Jones and Rene Hamlin commented that to do an official planting, a permit is needed. Kelly Cohen stated that there is a new Conservancy for the American River, but that it has no money. She wants to get letters of support from community organizations for bills in the legislature that would get money for the Conservancy. Jim Morgan commented that there are two bills, one each in the Assembly and Senate. Both are for bond money. One has $5 million for the American River Conservancy, and the other does not specify an amount. Lori Christensen stated that she would need to look at the specific language of the bills. There was discussion on possible action by BRECA, and agreement that additional information is needed. No action was taken. 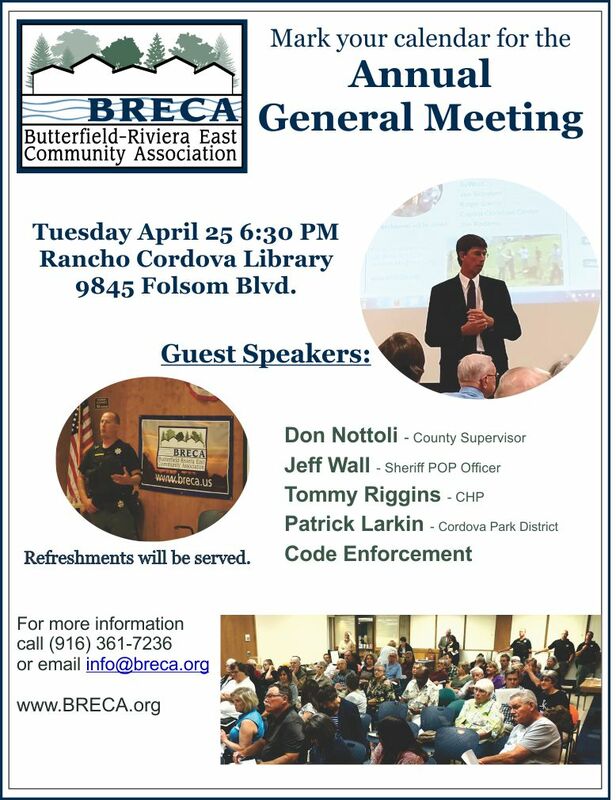 The next meeting will be a General Meeting on Tuesday, April 25, 2017, at the Rancho Cordova Library.